Nutty brown rice and red kidney beans in a juicy jalapeno and lime dressing make a delicious base for avocado, red onion, sweetcorn and feta – and tuck in a slice or two of watermelon for snacking. 1. Cook the rice in two cups of simmering salted water, covered, for 25 minutes or until tender and nutty. Drain and toss with red kidney beans. 2. Cook the corn in simmering salted water for 10 minutes or until tender. Drain and cool, then lightly char the kernels over a gas flame for one minute, turning. Cut the kernels from the cob. 3. Whisk the dressing, sea salt and pepper in a large bowl. Add avocado, turn to coat, then remove and set aside. Add the rice, beans, cherry tomatoes and chopped coriander and toss with the dressing. 4. Divide between plates or lunchboxes, and top with the corn, avocado, red onion, feta, dried oregano and pumpkin seeds. 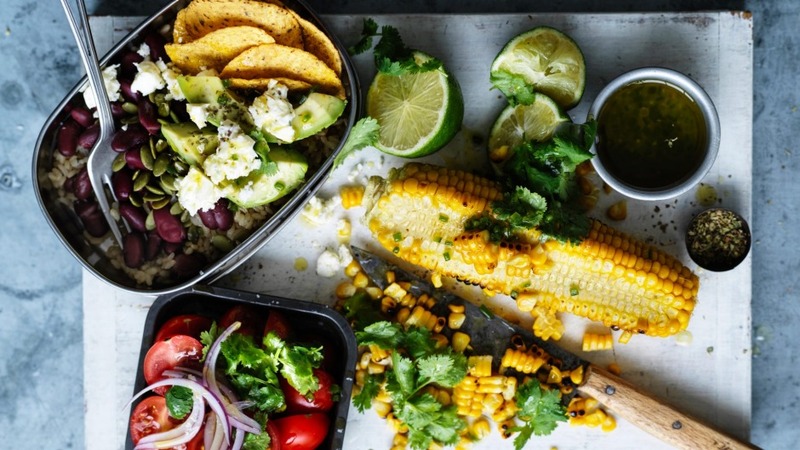 Tuck in the lime wedges and coriander sprigs and serve with corn chips.